This week-end I found time again to record another cover version – Brothers in Arms. After Six Blade Knife and Wild West End, this is the third video I put some additional effort into, which means I did not record the audio with the microphone of the camcorder but with the gear in our homerecording studio. Nevertheless it should be considered rather as “live video” and not as studio recording because I played the guitar plus the vocals in one complete live take – without any overdubs and without correcting little mistakes to leave it in a more authentic state. This time I recorded four takes all in all and then decided which one to take. The backing tracks were done some time ago – regular readers might remember the blog article about recording the acoustic guitar (my Gibson MK-81) and another one where I jammed to it and played a few solos. The backing track is available here. I recorded all audio with Cubase and a Creamware Scope system (now by Sonic Core) with which I also mixed the final tracks. The Hammond B3 emulation is also from the Scope system, and so is the reverb and all other effects (except a bit spring reverb from the guitar amp, and a sleight delay from the MXR analog delay). The drums are from Native Instrument’s Battery, a VST plug-in in Cubase. Maybe you are wondering how I synced the Cubase audio to the digital video file: in fact I did not sync them at all. Instead I recorded the audio in Cubase, and filmed myself while playing the guitar plus vocals. I later imported the video file and the mixed audio track into a friend’s Adobe Premiere. Here I visually aligned both tracks so that the waveform of the master audio track and the audio of the video file start simultaneously – at high zoom this is pretty easy to achieve. I found that for some reason both tracks do hardly drift apart over a time of just a few minutes. Then I simply muted the audio of the video file so that you hear the master audio only – that’s it. The same I did with the second video file. I guess there are a zillion tabs around that tell you which notes to play (I myself never play or learn anything from using tabs, by the way), so I am not going to talk about this stuff here again. 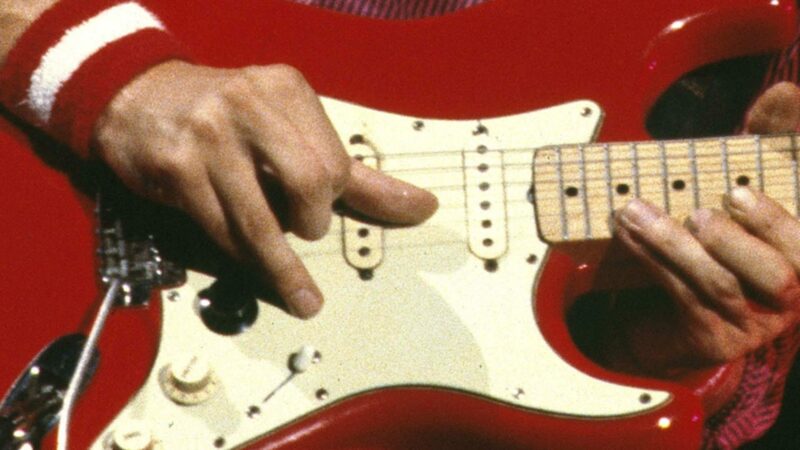 Besides I improvise a lot here: I found that as long as you stay in the G#m scale you can play more or less what you feel to and it sounds alright, the rest are all those licks I remember hearing in one of the many version Mark Knopfler did of this song. Each time I play it, I play it totally different, I never stick to a particular version. What however seems important to me is the use of dynamics. What I mean is to remember that good music consists of loud notes which are contrasted with low, subtle notes. Many players I see on youtube seem to play everything rather loud. The problem is that when you start a song like Brothers in Arms and hit all those first notes at – let’s say – 80% percent of maximum strength, you cannot go really higher to highlight other notes. If you however start at rather 20% – which I am doing here – you have more to add later. Besides, the sound will be completely different. Be aware that Youtube also compresses the dynamics, so in the room I played with even more contrast between loud and quiet notes than you are hearing here. Similarly, something like the original Sultans of Swing is played with a huge dynamics range (which is later reduced technically for some other reasons) and this causes a huge sound difference compared with playing with a small dynmaics range. I guess I might come back to this topic with a dedicated future blog article. Another good ‘un Ingo. You’re spot on about dynamics – not just for MK style, but for all guitar playing. Like you say, so many guitarists just go flat out 100% of the time, but the truly great guitar solos are all built around dynamics. It’s not just the force with which you play, its the ability to build tension and dynamism throughout the solo – it’s what make the Tunnel of Love solo so great, it builds in a way that mimics the human voice – like it’s telling a story, starting off slow and reflective then getting more passionate and emotional as it builds to a climax. All the best guitarists – Knopfler, Gilmour, BB King, Hendrix, SRV etc – have that vocal feel to their playing, stopping for “breaths”, talking softly then screaming or crying. Often when I’m improvising I will try to literally have a conversation in my head along with what I’m playing on the guitar – it makes the solo more real and human. The guitar is such an emotive instrument because it is in the same aural register as the human voice, and when a great player makes the guitar “cry and sing”, that’s when you get the goosebumps! Ingo, i really enjoyed that! Just spent some time letting my computer download it in HD! I can see the finger smudges on your guitar – terrific!!! Ich habe jetzt mehrere Wochen geübt um ein brauchbares Resultat mit brothers in arms hinzubekommen. Für den Hausgebrauch klappt es jetzt einigermaßen. An Dein Cover komme ich aber nicht heran. Seit längerer Zeit suche ich nach Unterstützung bei ” if this is goodbye”. Hast Du Tips zu diesem Solo?